my529 has expanded direct data feed capabilities for advisors whose clients have my529 accounts. Advisors with limited power of attorney authorization on their clients’ my529 accounts have been able to select a back office service provider for direct data feeds. 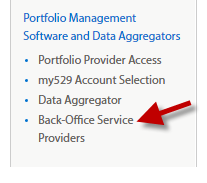 Now my529 allows you to select more than one back office service provider. For example, if you use one application for performance reporting and a separate application for client interactions or planning, you will be able to have direct data feeds into each system. Previously, you had only been able to select one. Choose either “Select All Owners/Beneficiaries” or “Manually Select Owners/Beneficiaries” to be included in the data feed. Note: The “Select All” option would automatically add any new accounts to the feed going forward. After setting up the data feed in Account Access, be sure to reach out to your representative at your selected back office service provider(s). Provide them your LPOA number and let them know you would like to start receiving my529’s data feeds.